Unexpected Homeschool: Back to Normal? Two appointments - that was it for this week! We had two regular appointments related to Amber's health, and it was a glorious Spring week spending more time at home. Amber has been on Reglan for 8 days now and we haven't seen any crazy side effects, although she had a few minor ones last weekend which have evened out already. On the positive side, she's able to eat more consistently too. No, she can't eat like an average person still and needs smaller meals while watching the types of food. Meat still is difficult as is anything with fat. However, food goes in and digests. We are now working on a more balanced diet within her tolerances since she can digest a wider range of food. All of this means we had time for an almost regular school schedule this week. After discussing how we want to proceed going forward knowing Amber will have two or three appointments each week, Amber and I have decided to leave the block scheduling behind at this point. While she enjoyed the block scheduling when her school time was limited, Amber thinks she would prefer to return to shorter but more frequent lessons in each subject. It's certainly easier for me to manage that type of schedule, however the block scheduling got us through a very busy and rough portion of the school year. Although we've decided it is not how we went to conduct every school day, it is still an option for us in the future. We decided at nearly the last minute on Monday evening to set aside Tuesday of this week as our Amber and Mom day for April. When reviewing our schedule for the month, we noticed a lack of days available for our dedicated time and so made the quick decision to take our day off on Tuesday. I did have a blood test scheduled already that morning, but otherwise we went shopping, had lunch at a restaurant we've missed greatly, binge watched Ninjago together while Amber assembled her new Ninjago LEGO set, and relaxed. Lots of yearbook class homework - It's all due next Thursday, the 21st. 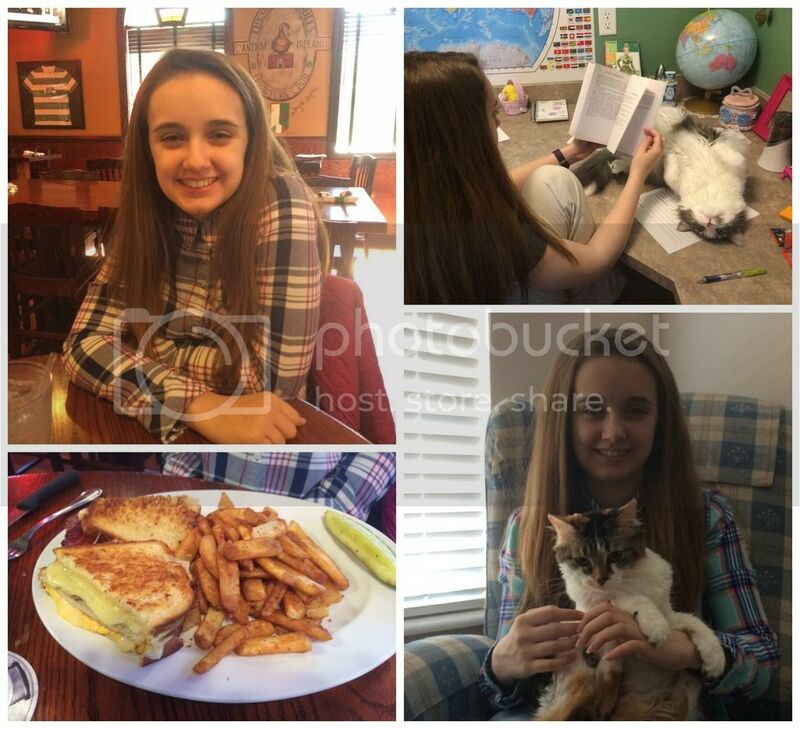 As we are nearing the end of eighth grade, I've been talking with Amber and working independently on possible high school courses for her to complete. Wednesday afternoon we had her much anticipated "High School Meeting." While she has understood the concept of what she needs to complete high school, I thought she deserved a full explanation and chance to choose much like the kids in private or public school. Since our state does not have any high school graduation requirements for homeschoolers, we went over what the state requires of public school students and specifically used my old high school as an example. It is still one of the best public schools in the state and they readily had the course guide online with class descriptions, suggested course selections for desired paths, and details of the graduation requirements. Many schools now have that information available only through parent portals, for which we do not have a password. It was actually blind luck that I found my old high school's information on a generic Google search. Amber apparently had already put a great deal of thought into her high school courses and how she wants it to all work towards her college career. Her plan includes five more total credits than required to graduate. She thoughtfully considered all the topics I gave her as viable options in the various subjects and came up with what she thought would help her become a well-rounded and informed adult. She has even chosen to complete four credits of science, while desiring to complete calculus as well. Lunch out - she attempted a 5-cheese grilled cheese and fries. She ate 2/3 of half a sandwich and 5 fries. But at least she ate! The goofy Milori in one of his regular homework positions. "Pet me. Pet me. Pet me. Pet me." Rosetta being cute and little. She will have a busy time in high school, however Amber stated her desire to work harder throughout high school than she has been in middle school. She also took care in planning a few of the more interesting or important classes earlier on to ensure they are completed if she runs out of time for everything on the schedule. Our planning meeting was an absolute success and rather eye-opening for me. In the past Amber has not wanted to discuss her future much for fear it would not end how she desired, but now she is taking an active part in designing her high school years. Now it's up to me to implement the outline Amber created, which means I have my work cut out as well! How awesome to hear Amber's thoughts on high school. It is such an exciting time in a young person's life. I am glad the Reglan is working. That med helped our oldest son tremendously when he was a child. I'm glad you guys had such a good week! When you mentioned Amber asking for more rigorous high school courses it reminded me of when my oldest son begged for a physics text book! You guys have a great weekend! How wonderful that she is so interested and willing to work so hard for high school! That's awesome. I'm glad she's able to eat more regularly too. Hopefully the medicine will continue to work well for her. We need to start thinking about high school for Philip as well. We have done some planning but electives are still open. 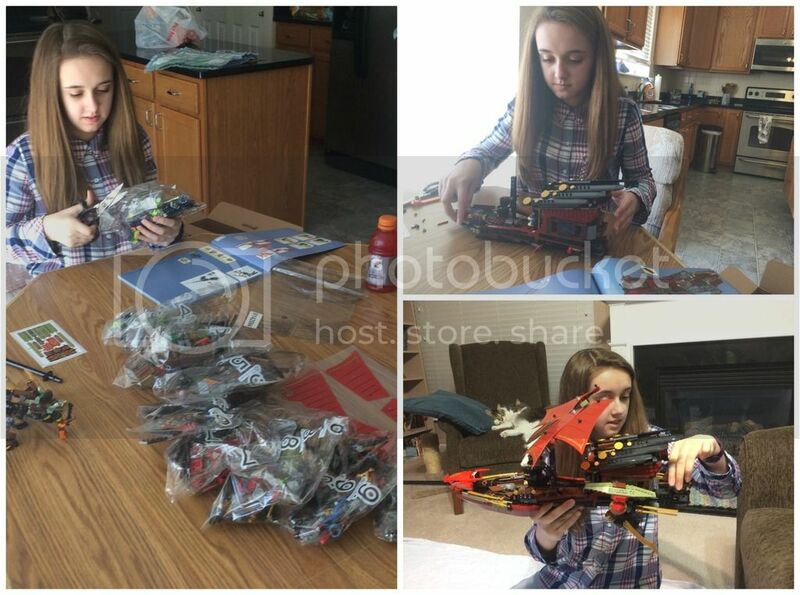 I am glad that Amber got to eat some food.That lego set looks huge.